I walked to the mailbox the other day and low and behold there was a package with my name on it. I opened it up and out popped this! A perfectly wrapped package from PinePlace! I knew in an instant where this pillow would call home! I paired it next to my $9.99 Pottery Barn pillows that I scored on clearance! What do you think? Perfection right!?!? Now it's your chance to have this darling pillow grace your home! #1- Share this giveaway on Twitter, Facebook or your blog. I am now a follower of Pine Place. I'm following and now liking you on Facebook! Love Pineplace and I am a follower. PS ADORE your blog- I read it every day! Darling pillow! And great blog at Pineplace. I've bookmarked them. Thanks for leading me to them. Check, check, check, check. Done! 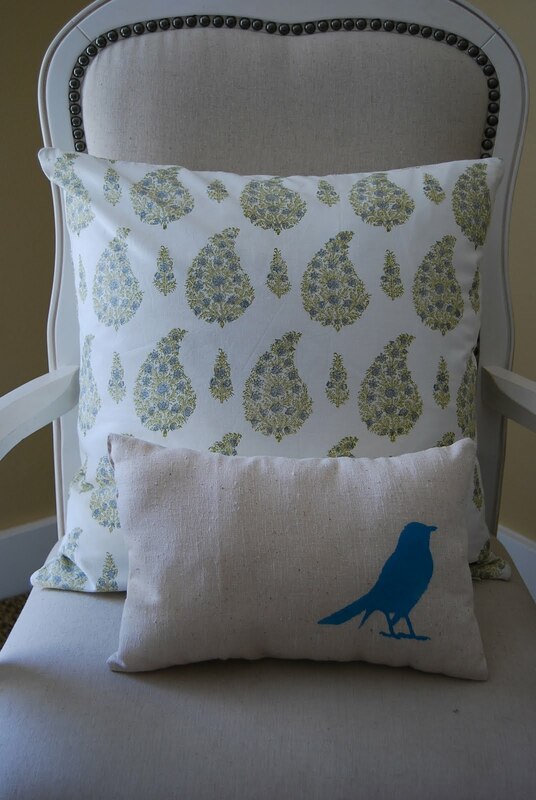 Now all's I need is a cute birdie pillow! I liked you on facebook...cute cute pillow! Although I'm not a huge fan of yellow, your yellow bed and the pictures Pineplace had with yellow may be converting me! Loved the sliding barn door. Checked Pinplace out on facebook. LOVE the Subway tiles! What a lucky day...I accidently came by your blog (which is wonderful) and there's also a chance of recieving a beautiful gift! What an adorable pillow!! I am now following the Pineplace blog! "Like" Pineplace on Facebook. Did I mention how much I love that pillow? Would looks so adorable on my couch.